Carpel Tunnel Syndrome is the result of the median nerve in your hand being compressed for some reason or another. This median nerve (one of the largest in the hand) is what allows you to feel sensations from your hand. When compressed, it can cause numbness, tingling, weakness, or muscle damage in the hand and fingers. The area in your wrist where the nerve enters the hand is called the carpal tunnel – which gives the syndrome its name. Excessive pressure on the nerve can lead to. What Causes Carpel Tunnel Syndrome? The carpal tunnel is generally narrow so any swelling can result in a pinched median nerve. Repetitive hand and wrist motions can attribute to Carpal Tunnel Syndrome in addition to other factors including: alcohol abuse, bone fractures and arthritis of the wrist, cyst or tumor that grows in the wrist, infections, obesity, and rheumatoid arthritis. Carpal Tunnel Syndrome mostly affects people between the ages of 30 and 60-years-old and is three times more common in women than men. How Do You Test for Carpel Tunnel Syndrome? Early diagnosis and treatment is crucial to prevent permanent nerve damage. A physical evaluation of the hand and upper extremities can help to determine if pain is from daily activities or if it can be attributed to an underlying disorder. After a physical evaluation, the doctor can confirm the diagnosis through electrodiagnostic tests. These tests measure the speed with which nerves transmit impulses and can more accurately confirm signs of carpal tunnel syndrome. Once a diagnosis is reached, there are several treatment options including surgical and non-surgical techniques. Wearing a splint at night for a few weeks. If persistent, wear the splint during the day as well. Taking non-steroidal anti-inflammatory drugs (NSAIDs) such as ibuprofen or naproxen. When you see a hand specialist for your carpel tunnel syndrome issues, there are several options they may recommend before considering surgery. One option may be a combination of activity modification and splinting. If this doesn’t work, your physician may consider corticosteroid injections. With this option, the corticosteroid will be injected directly into the carpal tunnel area to provide pain relief. Note: injections may only temporarily relieve symptoms and results differ between each patient. Open Release Surgery requires an incision followed by cutting the carpal ligament to enlarge the carpal tunnel. Endoscopic Surgery allows for minimal scaring and quicker recovery. During the procedure, the surgeon makes two incisions in the wrist and palm, inserts a camera attached to a tube, observes the tissue on a screen, and cuts the carpal ligament (the tissue that holds joints together). 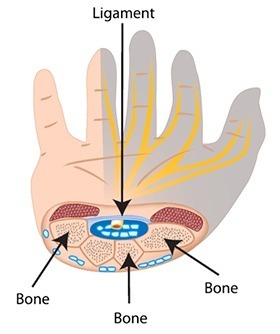 Depending on the severity and how long the nerve compression has been present, surgery is usually successful at eliminating carpal tunnel syndrome symptoms.